The Friday after coming back from the Pittsburgh Slovak Festival, I got my hands full again. 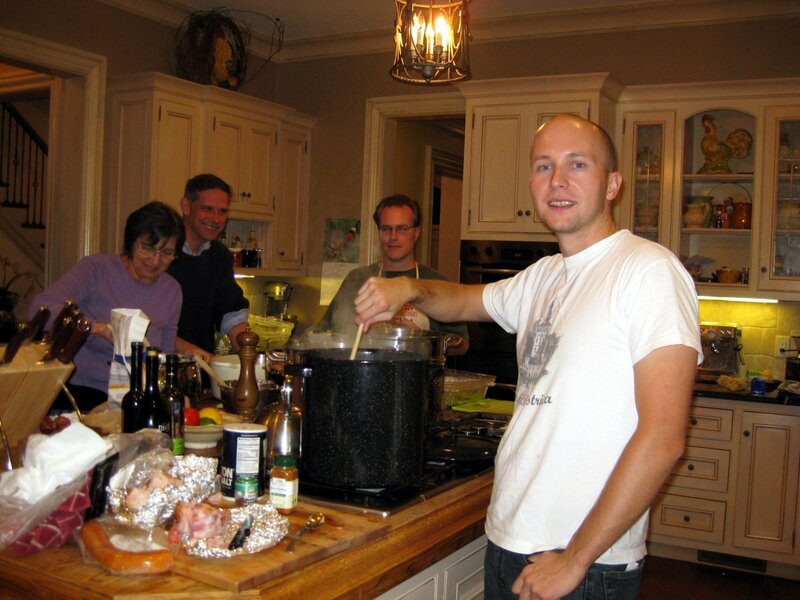 This time, with cooking for the Czech and Slovak Christmas Bazaar. The bazaar was put together by the Czech and Slovak Society for Arts and Sciences, SVU, in collaboration with the Czech and Slovak embassies, and took place Saturday, November 12th, at the Unitarian Congregation Hall in Bethesda, MD. SVU is a cultural society established in in 1958 in Washington D.C. At that time, the socialist crack down on free expression in Czechoslovakia was strengthening, and the society was organized to give a voice to the Czechs and Slovaks, mainly those living abroad. Nowadays, the society has over 3000 members scattered through out the world. Many of the members are notable researchers, scientists, performers, or artists. Members even include the Czech president Václav Havel and the famous Slovak composer Eugen Suchoň. This bazaar is a place to pick up few Christmas trinkets. But it’s mainly a place to come feast on delicious traditional Czech and Slovak dishes. 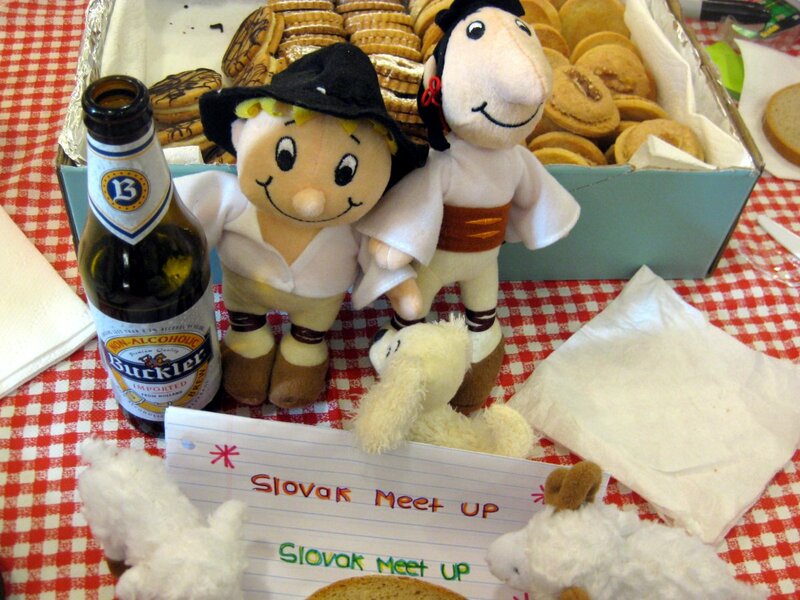 The Czech and Slovak Embassies typically prepare their respective share of specialties. However, this year the Slovak Embassy chef was busy with the visit of the Slovak Prime Minister Iveta Radičová. So the folks asked if I could help out. I figured why not. And since cooking for 100 is no easy work, I had folks from the Washington Slovak Meetup come out and help. Tonya Harmon, from Pauline’s Cookbook, and her husband Nick, hosted us in their humongous kitchen. So what was the menu? We prepared the sauerkraut soup for 100, potato dumplings with bryndza and with pork cracklings for 80, with sauerkraut for another 20, big baking sheet worth of farmer’s cheese cake, and a couple more sheets full of filled buchty. 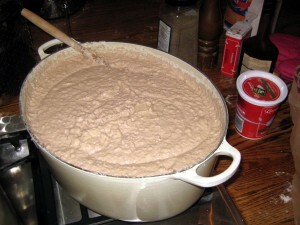 We started with a batch of kapustnica. 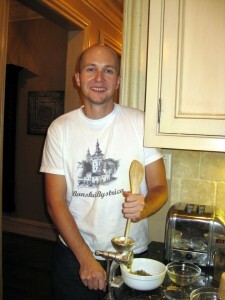 In the meantime, the other folks got their lesson in a very important Slovak cooking skill: peeling potatoes. All 30lbs of them. 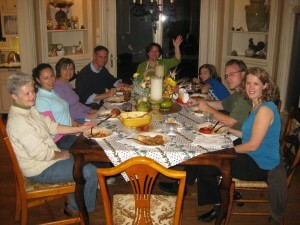 While all this was happening, Tonya managed to somehow cook dinner for us, without any of us noticing. She topped the dinner with a really delicious treat made out of chestnut mousse. This is what the dough for potato dumplings look like. 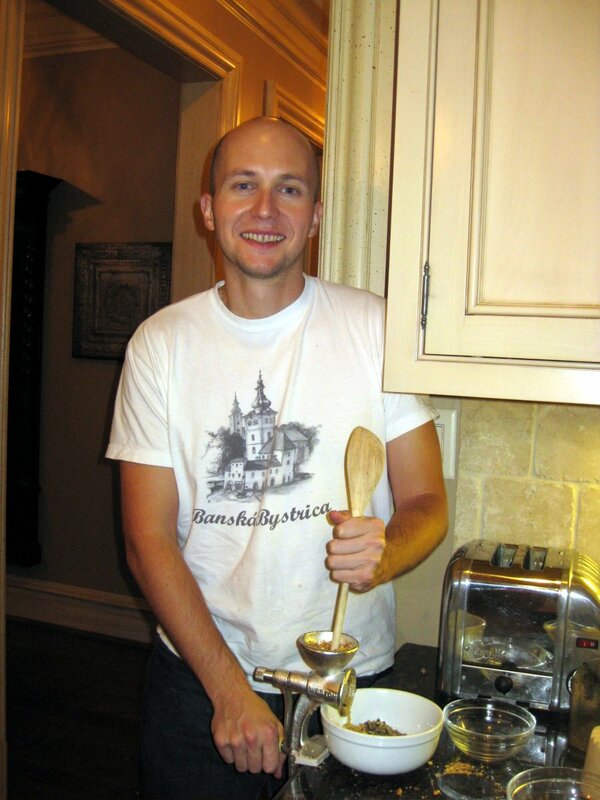 To make halušky, you can get a little perforated spatula-like contraption called haluškár. Or you can toss them the traditional way, using a cutting board and a butter knife. My mom taught the folks how to do this. My friend Sandra, who is originally from Colombia, was absolutely amazing. My bet is on Sandra if she ever gets in a halušky tossing contest with my grandma. I bet she could win! While the dumplings were getting tossed, Nick and I went about griding poppy seeds and nuts for the baked buns. Here I am grinding the walnuts the way my grandma taught me. We also tried using the coffee grinder for the seeds. The results were not good. The right image shows our little experiment. The top row shows seeds ground in my old-fashioned grinder on fine and coarse setting, while the second row are the seeds from the coffee grinder. In my opinion, the finely ground seeds from the seed grinder tasted the best. The pressure action of the spinning wheel squeezes out the oils and turns the seeds into paste. The seeds from the coffee grinder were too dry. They tasted like dust. Of course, all this work makes one thirsty. This yellowish liquor is called Becherovka, and it’s the traditional alcoholic drink of the Czech Republic. Go to the Prague airport, and you’ll find stores selling nothing but Becherovka. It is a type of liquor called bitters. It is made with herbal components, and it’s these herbs that give bitters their characteristic bitter taste. Jägermeister is an example of these types of drink. Becherovka is not very common in Slovakia, but another Czech bitters, Fernet Stock is extremely popular. 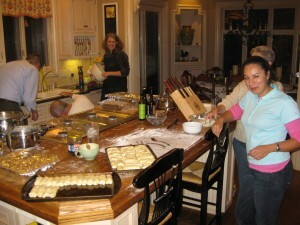 The sweet dough puffed up nicely in the mean-time, and Renata and I went about filling the buns. We made all different kinds. There was one pan full of farmer’s cheese, my favorite. But we also filled them plum butter, apricot jam, poppy seeds, and ground walnuts. 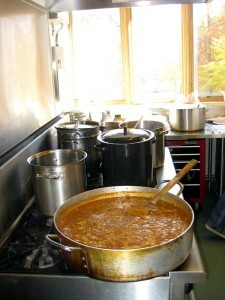 The beef goulash cooked by the Czech embassy. Also a photo with the two ladies from the Czech embassy who helped hand the food out. I, my mom, and the Czech chefs, filled the plates and handed them to the girls to give to the customers. In the front is a bottle of Trader Joe’s kefir that we were serving to go with the halušky instead of the traditional zákysanka. About 20 folks from the Washington Slovak Meetup also showed up. Those cookies were baked by one of the Meetup members, Danka Plevková. She is an amazing baker and runs a bake shop so if you are looking for Slovak cookies, make sure to contact her. THANK YOU! I tried your steamed dumpling recipe- my favorite dumpling made by a family friend from my childhood. I hadn’t found a recipe until now. I tried it first with pizza dough I bought from the store so I could practice just the cooking technique and it was fantastic. 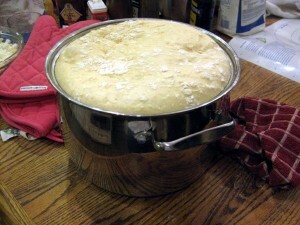 Now I’m going to try making the dough myself. It turned out so good I immediately thought the technique could work for all kinds of filled dumplings. 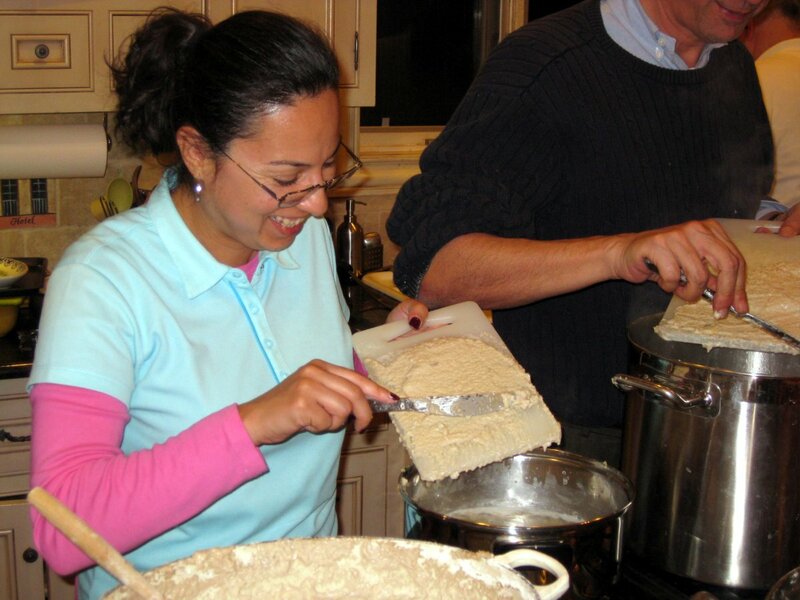 I wonder if I could even use the sweet dough you mentioned in this article? What do you think? 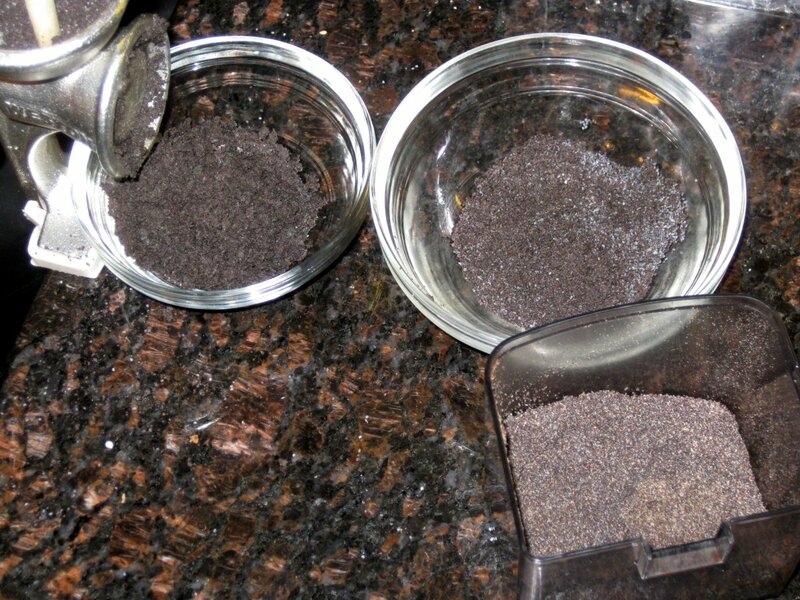 About poppy seeds since you mentioned them in this article: I am quite sure the seed grinder you used is better. It’s designed for this purpose. The coffee grinder I used is the inexpensive kind that fits in your hand and has a blade that spins around on the top. Makes terrible coffee but I had good results with the poppy seeds. They didn’t turn out dry. Hello! My boyfriend and I attended this event on Saturday and it was wonderful! He is of Slovak lineage, so we were excited to find an event that highlighted his heritage. We tried several pastries and they were all delicious! 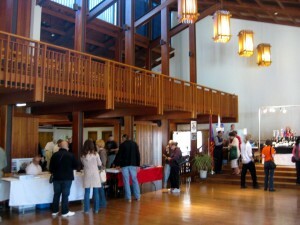 We really enjoyed the info we received at the Slovak Embassy table, and the live auction was great too! Wonderful event and we hope you have it again next year! Velmi dobre spracovana website. Vdaka za sirenie slovenskej kuchyne.Tieto recepty si zasluzia aby boli propagovane, lebo za niekolko rokov by boli privlasnene Cechmi.Su velmi hrdi na ich jedla. Minule som nasiel recept na Gulas a ta lady tam dala 4 polievkove lyzice kristaloveho cukru.To musela byt torta…. Ale co je hlavne tak to bol “Cesky Gulas”. Este raz VDAKA za recepty, ktore nam posielas!!!!! !